Bridal gowns are a central element of any wedding. They can also be a major budget buster. Brides across America spend an average of $1,564 for a wedding gown, according to The Knot’s 2016 Real Weddings Study. That’s over five times the $280 grooms spend on average for their wedding day attire. And then there’s always the question of what to do with a wedding dress afterwards? If you’re planning to save it for the next generation, it could take up valuable storage space in your closet and even still likely could be passed over for being out of style. And you’ll probably have to shell out several hundred if you’re getting it professionally preserved, according to Brides. Some brides, instead, spend extra funds on “trash the dress” photography packages. A more economical approach may be to go the rental route. Grooms have long rented tuxedos, so why can’t brides rent their gowns? After all, it’s a dress likely to only be worn once. You can check your local dress shops to see if they rent out bridal gowns. Stores specializing in black-tie attire or even prom dresses may have options you’d love for your wedding. In Tampa, Florida, Lending Luxury rents bridal gowns for prices that are up to 80 to 90% off the retail price, co-owner Jennifer Rosen told The Penny Hoarder. The rental includes dry cleaning and insurance, and brides can rent the gowns for five-, 10- or 15-day periods. “You could put that money towards something else, towards your honeymoon or a house,” she said. Plus you’ll always have photos of you in your wedding dress, Rosen added. If you can’t find a local shop renting wedding dresses, the following three companies cater to brides across the nation by shifting the dress selection process online. Borrowing Magnolia brings designer gowns to brides at a fraction of the cost by renting instead of purchasing. Current rental rates start at $400. Sizes range from 00 to 26. 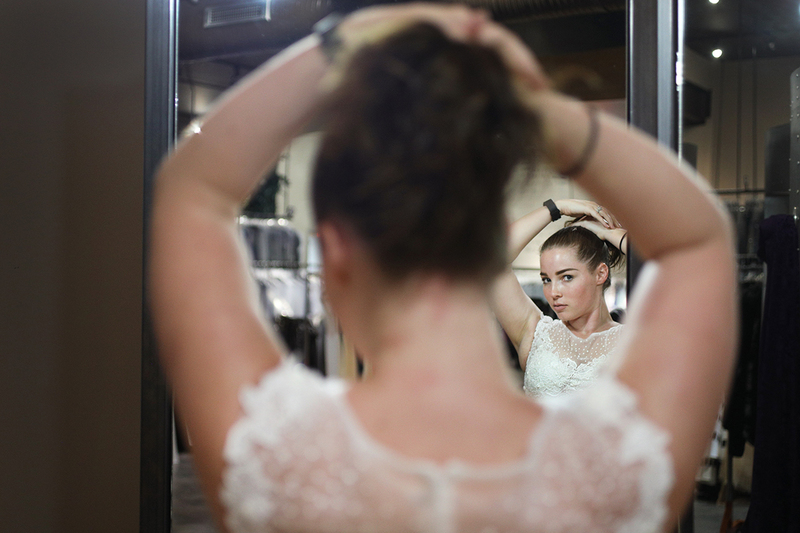 The company tries to ensure the perfect fit with its virtual sizer, which takes a bride’s measurements and matches her up with dresses available that fit her body type. Once a bride selects a dress — or two or three — she’s interested in, she can have them shipped to try on for five days for $40 for the first dress and $29 for each additional dress. Borrowing Magnolia includes prepaid shipping packages to return the tried-on gowns. After the bride selects her favorite, Borrowing Magnolia will ship the rental four weeks before the wedding date. The company says reversible alterations are allowed with most dresses. The dress rental must be shipped back via FedEx within four days following the big day. Brides can also purchase $50 insurance to cover minor stains and damage up to $500. Rent the Runway has a variety of styles for brides to choose from with rental rates currently ranging from $30 to $390. The retail prices of that same selection of dresses range from $100 to $2,995. Sizes range from 0 to 26. Rent the Runway says brides get a free backup size when they place their rental order and those who desire an additional option can order a second dress in another style for $32.50. Brides can choose to purchase $5 insurance to cover minor stains and damage. Brides can rent their dresses for a four-day or eight-day time period. After the wedding, the renter just ships the dress back via UPS at no additional cost. Late fees will occur if the item is not shipped back on time. Vow to Be Chic’s Little White Dresses collection allows brides to rent designer dresses shorter than gowns but fitting for a bride going for a more casual vibe. The current frocks available for rent through the site range from $50 to $125, though the retail prices range from $274 to $795. The company recommends you get professionally measured before you choose your dress, and you can also select a second size to be sent to you at no extra cost. Sizes range from 0 to 18. Some dresses are available for brides to try on beforehand for $19.95 each. Vow to Be Chic says the dresses are shipped out to renters a week before their event and must be returned via mail within three days following the big event; otherwise renters will incur a late fee. Normal wear and tear to the dress, like minor snags and small stains, is covered. A wedding ensemble isn’t complete without a few accessories. Luckily, brides on a budget can rent veils, headbands, belts and more at Happily Ever Borrowed for a four-day or eight-day period at rental rates about 20% of the retail price. Brides who want to wear thousand-dollar diamond jewelry can rent pieces from Adorn at prices that start from under $100. And if you just can’t get on board with renting items for your special day, some other cost effective options for your wedding dress include shopping at a discount retailer, scoring a deal at a sample sale, purchasing a pre-owned dress or tailoring a gown passed down from a family member. Now, renting a wedding dress may not be for everybody, particularly a bridezilla a more finicky bride who wants to customize her dress down to the smallest detail. It also wouldn’t work for a woman who plans to save her dress as an heirloom. But for a bride looking to cut costs so she isn’t paying back expenses from her big day for years, renting a wedding dress just might be the way to go. Nicole Dow is a staff writer at The Penny Hoarder. She’s never been a bride but has been a bridesmaid twice — and rented her gown during one of those occasions.